The Portugal Years: The Bridge 25th of April. 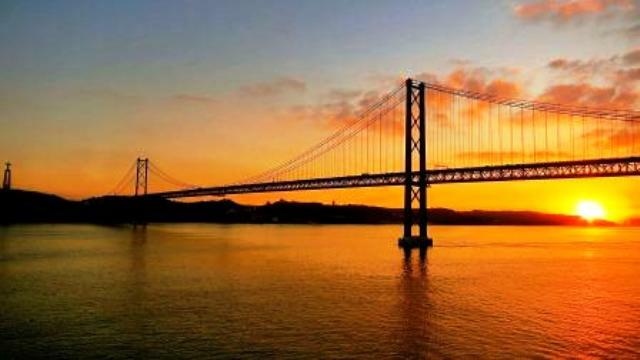 The 25th of April Bridge in Lisbon over the Tagus River, opens the list of the 15 most beautiful bridges in Europe, according to a list of Best European Destinations (EBD), a travel organization promoting culture and tourism in Europe. The Lisbon bridge, similar to Golden Gate San Francisco, USA, was inaugurated on 6 August 1966. In addition to this, the Luis I Bridge (or Don Luis, as it is known), in Porto, earned the fifth. The site advises crossing the lower deck to reach Gaia and its banks, as well as a boat trip on the Douro to admire the bridge. Already the Vasco da Gama Bridge, also in Lisbon, is the longest bridge in Europe (including viaducts) and occupies the 14th position in the list. It was inaugurated in 1998, the same year that the Expo 98 was made. The dictator, Salazar, had ordered it to be built and it was inaugurated in 1966, and the bridge was named Salazar Bridge in his honor. The bloodless revolution in 1974 did away with the dictators as the soldiers put carnations in their rifles. It occurred on April 25th and they changed the name to The 25th of April Bridge. There is a celebration each year on that date as they consider it their day of independence. What a beautiful photo. And I love the story about the soldiers putting carnations in their rifles. The world could do with some flower-rifles right now, I think. I totally agree with you on that one, Lucy. That dictatorship lasted for many decades, and the leadership got richer and the citizens poorer. The poorest of them had meat only once a week, on Sunday when they had a chicken. The workers got the lion’s share and the children got the wings and such. That is dreadful. I will never understand man’s inhumanity towards man. You have a tender heart. I would film some videos there. As long as you don’t get me in the camera’s range. It’s not pretty. That’s all I can say. Well, neither is the professor. The guitar is, though. Oh, I wouldn’t say the Professor isn’t pretty. He’s pretty slick is what. But the guitar is beautiful. Huff-Hum and a roar! Yes… *sighs* Guitars are works of art! Ah, do you like Martins? I see how your wicked mind works! The 25th of April being the Lovely Charlotte’s birthday,it is of course now in my head as: The Charlotte Bridge. Wonderful post!!!! Thank you! It is a wonderful bridge. What a lovely photograph! Woof! Thank you! I rode across there many times when we lived there. That bridge would stress me out. I’d have to conquer it. Multiple times. Amazing what a society can survive. Haha…indeed. I shall have no fear. 3 bridges in the top 15? Not bad! I read a book set in the Salazar period a few years back and was surprised that I didn’t remember anything about it. I don’t think we got much ‘foreign’ news back then unless it directly affected us. He was not a well-loved dictator. He was an economist, actually. Which could explain a lot. It is, isn’t it? So many reasons for me to love Portugal.